Google rolled out a big redesign for Gmail on the web last spring, adding features like Confidential Mode, Smart Compose, Snooze, and more. Now the focus has turned to its official mobile apps. Gmail for Android and iOS will be overhauled with a cleaner and more modern look, which will make dealing with your email much simpler. The update is part of a larger effort to make G Suite look more like a family of products that sport the Google Material Theme — like Google’s default Android apps — with ease-of-use in mind, the company says. The redesign will allow you to quickly view attachments, like photos and documents, without having to actually open them up or leave your conversation. It will also make it easier to switch between personal and work accounts. What’s more, it will bring security alerts that help you identify and avoid phishing emails. 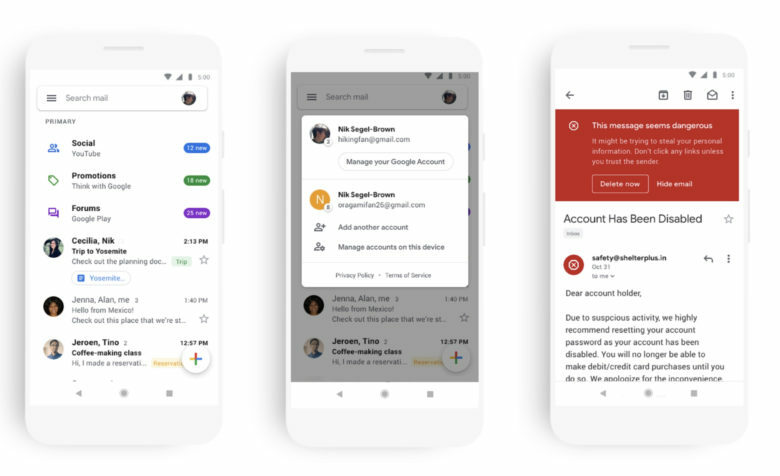 Google says the new Gmail will be available on Android and iOS “in the coming weeks,” while other G Suite apps for mobile will be overhauled later this year. Keep an eye on the App Store for the latest Gmail updates.